The harp in my avatar is not my harp, it's the harp I daydream about. 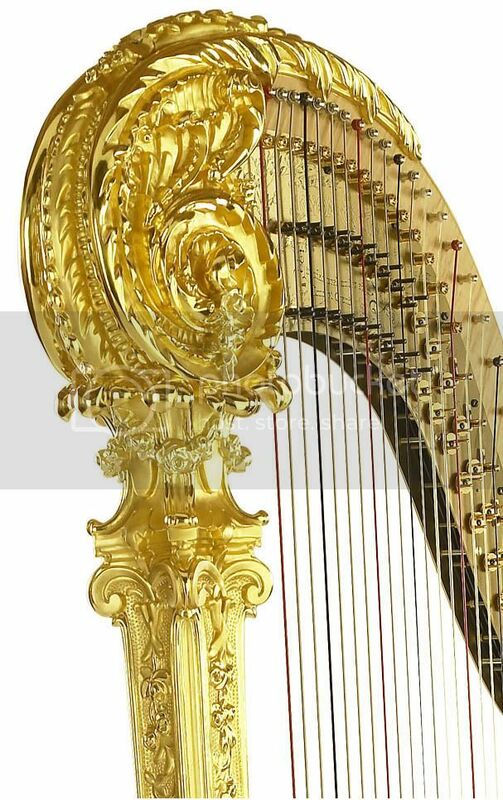 It's the Louis XV Special Concert Grand 23k harp available from Lyon and Healy, and it will be mine when I raise $179,000.00. Plus tax and shipping. I love it because it is so completely, insanely, over-the-top. The original was commissioned by the owner of a coal mine for his daughter and was finished in 1916 after craftsmen worked on it for two years. I think the coal miner must have a) really loved his daughter's music and b) had more money than he knew what to do with. The history of the original instrument is interesting and includes time spent in museums, and ownership by a number of famous harpists and recordings made from it. Because you see, it is not only finely made, it is reputed to have a spectacular sound. So this is the harp I want, if I come into a fortune somehow or win the lottery. Or maybe this is the one I'll get if I get to heaven. I'm hedging my bets on getting in - I think they probably need more harp teachers up there. Beth, I like cold December days too, but in really small doses. Blakely, the flowers look better than the ones in my yard. We have a problem with deer munching blooms. What a Card, I'm too nervous a mom to let her try rollerblades yet. She does ice skate, but I think the old fashioned skates are just fine for sidewalks. Amy, we are lucky here that it's never humid. Summers are pretty nice. Good N Crazy, I inherited some roses when we moved in here, and I've learned to deal with them, but they're not my favorite to grow either. I like the climbing ones I put along my fence though -- those are the ones in my header. Noble Pig, I used to have skates like that when I was a kid. I love them too. Angie and Scary Mommy, isn't it funny to get nostalgic when it's barely over? But between kids going back to school and all the Halloween stuff in stores, I feel like summer is long gone. I so hope you win the lottery! What a rococo tour de force...the fact that it is reputed to sound as lovely as it looks, well that's simply icing on the cake. I am pretty sure if you play the harp you automatically get in to heaven. There is a shortage up there. SO good for you. Wonder if it is too late for me to learn to play? Yay! OH my gosh...the harp story...FINALLY. And girl we can do it...$179K? No prob. After I get my 401K up to snuff and my kid's college funds raised, and my dream summer cottage complete with the most awesomest crafting studio...oh sure! I was wondering about that harp! Do you play the harp then? My college musical appreiciation teacher was a harpist. She said she always wanted to play the harp and her parents told her that if she could stick to piano lessons for 3 years (or some such similar number) then she could start on the harp. She did and they came through. So I am even flattered that you bother to read my low brow blog because it sounds like you are a very fancy lady. It's beautiful! You deserve it, just charge it! I had a little heart attack when I saw the price tag. But it is a gorgeous instrument. Here's to winning the lottery...no, make that PowerBall, because m'dear, you'd want a home, every bit as grand as that harp, in which to display and play it. You would think for 179,000.00 they could throw in free shipping!